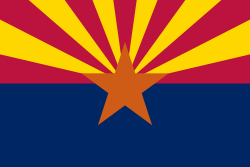 क्षेत्रफल Ranked 6th in the U.S.
जनसंख्या Ranked 16th in the U.S.
Ranked 35th in the U.S.
↑ All about Arizona. http://www.sheppardsoftware.com. Accessed 2010-09-21. This page was last edited on ५ जुलाई २०१४, at १७:२०.